I am still wading through my vacation photos but here's a little preview from the amazingly beautiful Budapest. 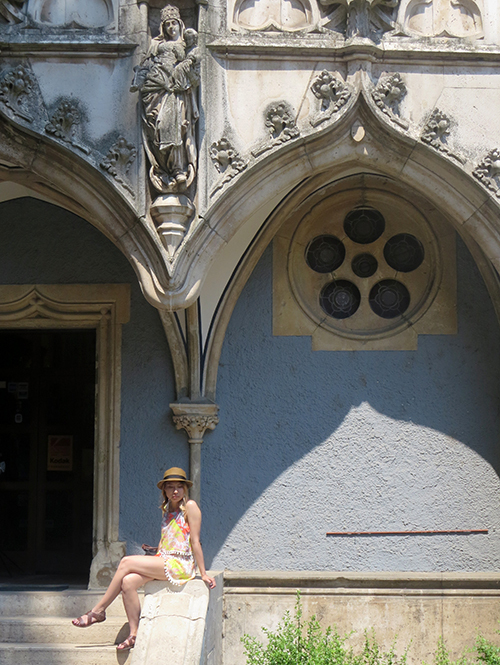 These were taken around the Vajdahunyad Castle in the City Park. The castle structure features an intentional mix of architectural styles, from Romanesque and Gothic Renaissance to Baroque, and is surrounded by a lake that becomes a skating rink in the winter. It honestly looked like something out of a fairytale. As for my outfit, I've become obsessed with matching top/short co-ordinates (which you'll probably be seeing a lot of on the blog this summer). This Raga Tahiti Set turned out to be perfect for keeping cool in the hot Hungarian weather. This is one super cute look!!! Beautiful pictures! It looks like a fairytale indeed. love that romper! u look amaze! xO!